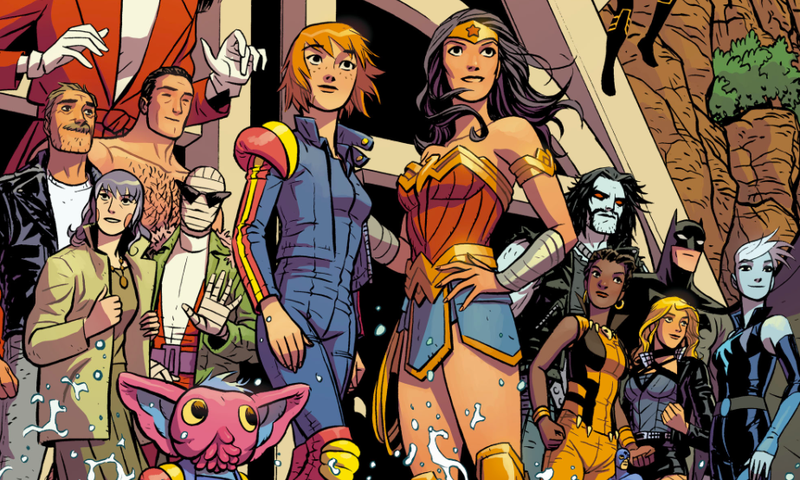 The Justice League and the Doom Patrol. While plenty of comic events are basically the same—universal extinction-level threat, a team (or even teams) of heroes coming together to fight the good fight—DC and Young Animal’s Milk Wars has been the weirdest and most fantastically unsettling comics event from a mainstream publisher in recent memory. It’s not just that Milk Wars’ story about a reality-warping inter-dimensional corporation is interesting (it is), it’s also been flat-out weird and irreverent and fun from the very first issue. As serious and frankly disturbing as the implications of Milk Wars’ plot details are, the event’s never taken itself too seriously, something you can see in a handful of its most mind-bending moments—and here are our favorites. Milkman Man fighting against his mother, Casey. Retconn, the evil reality estate corporation at the heart of Milk Wars, is in the very profitable business of packaging and reshaping entire universes in order to sell them off as luxury goods. Because the universe containing Earth Prime was so chock full of heroes with the collective power to resist Retconn, the organization took extra steps to “sanitize” everyone and turn them into disturbingly wholesome, bizarro versions of themselves. Unlike the rest of the heroes transformed by Milk Wars, Superman’s specific connection to reality could not be altered, forcing Retconn to create its answer to the Man of Steel from scratch—“scratch” in this case being the mind-altering milk Retconn uses to bend reality. Milkman Man was everything that Superman was—good-natured, kind, and driven by a sense of justice—but warped by a twisted arrested development that also made him a monster. Milkman Man wasn’t Superman’s evil twin as much as he was a frightening version of what kind of person Clark Kent might have become if the character was stuck in a 1950s sitcom. Father Bruce preaching to his cult of children. While Milkman Man had a number of things in common with Superman, Father Bruce and Batman were quite dissimilar from one another save for one of the odder things about the Dark Knight. Like Batman, Father Bruce was compelled to seek out young kids to recruit them into his personal ongoing crusade for justice. But Father Bruce’s Holy Sidekick Choir of Merciful Justice was distinct from Batman’s brand of mentorship because it wasn’t at all focused on actually helping the young wards become stronger, better people who could make change in the world. Instead, Father Bruce treated his outreach into Gotham as a means to recruit children into his milk-worshipping cult. Wonder Wife bathing in milk as she’s attended by her Shade Force. After being transformed into the Wonder Wife by Retconn, Wonder Woman became a paragon of stereotypical femininity and domesticity. Steve Trevor’s needs came before her own, she wielded a golden vacuum cleaner, and her ability to keep a clean home was one of the things she valued most about herself. Much of Wonder Wife’s character is all about keeping up appearances, and so the Stepford Wives-esque horror of who and what she is isn’t immediately clear until she began to lovingly breastfeed a handheld vacuum cleaner as her group of assistants watch on. Cave Carson violently throwing up his lunch and Swamp Thing. Like many of DC’s heroes, Cave Carson—a spinoff character from the 1960s series Challengers of the Unknown—and his cybernetic eye got caught in Retconn’s altered reality. But unlike most everyone else, Cave went with a very specific plan in mind that involved him being captured. As an elemental with a connection to the Green, Swamp Thing was uniquely positioned to sense Retconn’s alterations to reality almost immediately, something that made him seek out Cave Carson’s help. When the two realized where Retconn’s base of operations was, Cave deduced that they’d have to actually break inside, something requiring Cave to undergo a milk mind-washing. Unbeknownst to anyone at Retconn, Cave came into Retconn with a piece of Swamp Thing in his stomach, which Cave was able to throw up after eating a bunch of salad in order to basically... give birth to the heroic planet elemental. As if that wasn’t odd enough, moments after pulling himself together from the remains of Cave’s lunch, Swamp Thing started performing exorcisms to get all of Retconn’s milk out of people. A living Superman doll made from organic flesh. At multiple times throughout Milk Wars, characters interacted with cute, miniature versions of one another that Retconn sold as merchandise similar to Funko Pops. For the most part, Retconn’s collectibles didn’t factor much into the story until Cave Carson made the horrible discovery that the toys were alive and homicidal. Still cute, though. Retconn’s human-powered Human Resources department. While on their mission to destroy Retconn’s headquarters, Cave, his daughter Chloe, and Wild Dog deduced that the company was actually using the collected imaginative energies of a reality’s creative, artistic minds to power the mechanism by which they altered and reshaped reality. Setting free the tortured minds of countless thinkers trapped within Retconn was the only way Cave could think of to stop them from destroying everything. So, Cave and co. set out to liberate the pour souls from their hellish prisons in Retconn’s Human Resources department. The most surprising twist to come out of Milk Wars happened just as the event was coming to a close, when it seemed as if there was no way that Retconn could ever be fully stopped. As the heroes fought their very hardest to maintain a firm grip on their reality, somewhere in a space beyond all existence, Rita Farr, the original Elasti-Woman, struggled in a battle of her own. Though she was at one point a part of Prime Earth’s larger reality, it’s revealed that Retconn spun her out into a reality all her own that aired like a popular made for TV movie version of The Passion. Presumably, Rita was stuck reenacting the life and death of Jesus Christ over and over again for the entirety of Milk Wars. But unlike most everyone else in the multiverse, Rita exhibited a unique sort of resistance to the organization’s milk—likely something to do with the innate elasticity of her mind. Because of her Resistance to Retconn, Rita was able to recall elements of her past life and her abilities, ultimately leading her to manifest a new ability to stretch her consciousness beyond her physical form. Rita’s escape from Retconn’s physical clutches resulted in her effectively being reborn into DC’s prime universe, where it stands to reason that she’s back in the comics for good.